It’s been a long journey since The Jace Magazine first debut in 2008 and after a four-year hiatus we are getting back into delivering powerful testimonies. The Jace is also now dedicated to giving back to the community and now as a non-profit organization, the magazine is looking to raise money for the publication as well as donate to others. This summer Petrina Johnson (Founder and Publisher) organized a back-to-school fundraiser to buy backpacks for children. Several back-packs were purchased and donated to two schools, one in Harris County and the other in Montgomery County. Unfortunately there was no money able to go towards the magazine, but Ms. Johnson still believes she can raised funds to also help support the organization. The Jace held its 2nd annual holiday fundraiser again this year, helping four families with Christmas gifts for the children. More than $200 of gift cards and monetary donations were provided. We want to thank everyone for their ongoing support and look for new and better things in 2016. Remember we are The Jace Magazine, given you testimonies for the soul! Picture Caption:Irma Hernandez and her daughter 10-year old daughter Linsey were one of the recipients of the The Jace Magazine 2nd Annual Holiday fundraiser. 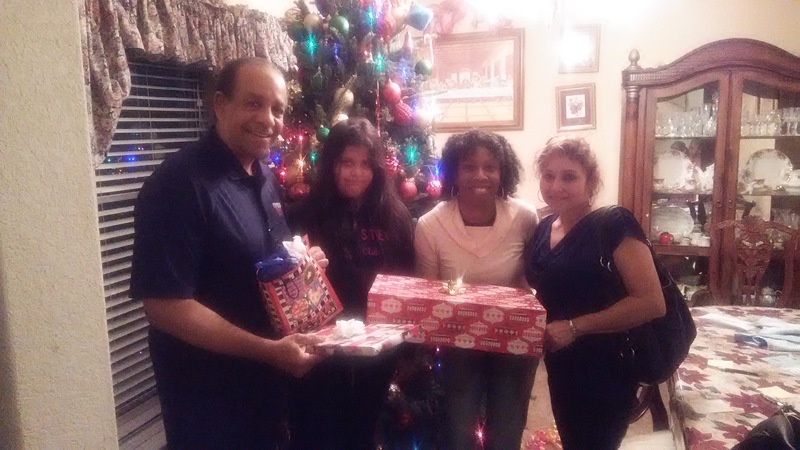 Left to right Mr. Glen Etienne (President of Cypress-Tomball Democrats), Linsey Hernandez, Petrina Johnson of The Jace and Irma Hernandez.